As I've seen solar energy and solar panels becoming more advanced, flexible, and popular it's been exciting to watch the corporate world respond. Earlier this week Google announced that it will be exploring the industry as a competitor. Earlier this year they actually installed panels on their main building in Mountain View, where I used to work. That's not to say other industry giants were missing out. 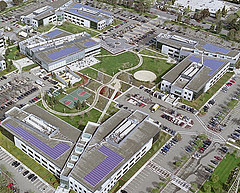 Solar panels on Microsoft at Silicon Valley have been in place since April 2006 and Hewlett Packard just announced plans to add them to cut ~$600K in costs from their San Diego campus.